I’m officially writing to you as a 26 year-old (gasp!) And I will say, last Friday was quite possibly the best birthday I’ve ever had. 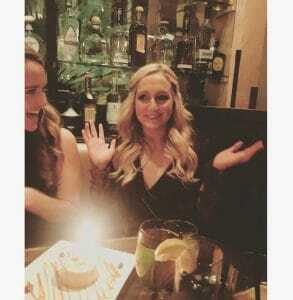 Wait, no, it WAS the best birthday I’ve ever had. One of the highlights of my birthday weekend was taking a Barry’s Bootcamp class with my bosses/mentors from Boston taught by one of my former mentors in Chicago. Cole Cruz’s class was so hard, but tolerable thanks to having my Boston friends class. If you haven’t taken Cole’s class in Chicago– go book your spot ASAP! In today’s update you will learn about how Week Two of my powerlifting prep went, find a review of protein bars I tried last week, enjoy a synopsis of how I balance going out guilt-free and then you’ll catch some awesome fitness reads! Quick update: The next #Daretoeat group program begins January 8th, email me at gwcrof@gmail.com if you want to pre-enroll! Overall Week Two of training went really well. I did more cardio than planned because Barry’ Bootcamp is just too much fun. However, I did all my powerlifts before doing three Barry’s classes in a row. Read on! The plan for Monday was 4×6 with 220. I had no clue how it would go and to my surprise it went very well. See below for my final set of 6. Derek’s Arms and Abs class to get in some sprints. It was a fun time 🙂 If you haven’t taken his class, get there!!! Thursday: Back squat day + Barry’s Bootcamp with Emily Southworth, aka Embo! Embo’s abs class was fun because we did a TON of side shuffling and I had my colleagues Chris, Durk and Kelly to run with me! During this class I went very easy on the running portion and light on the weights. I met a really nice Chicago trainer named Andrew — take his class! Also, my college friends, Molly and Audrey, got to do their first ever class and became obsessed!! As noted in last week’s CROF Weekly Update, I began an elimination diet last week. I wasn’t upset or worried about it at all. I simply knew that I had to make some adjustments–cutting out ALL the Quest products and other protein bars I love was one of them. Since I’m often on-the-go, I had to try and find some new bars that didn’t have any polyols in them. I also had to cut out mushrooms, avocado, cauliflower and some fruits I don’t typically eat. For today’s nutrition update I will start with ranking the new bars I tried from best to worst, noting one pro and one con. See below. 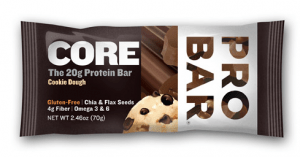 The Core Pro Bar was my favorite, probably because it tasted like a cookie and cake dipped in chocolate. Pro: taste and texture. Con: 270 cals and 14 grams of fat…. (I typically don’t go over 200 cals with protein bars). 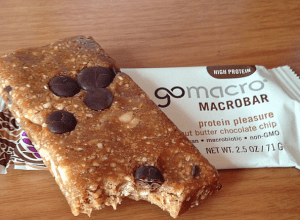 The Go Macro Bar was a bit chewy but not bad. It too, was higher calorie and fat than I’d like. The peanut butter flavor was better than the cashew butter flavor I tried. Pro: rich taste Con: Cashew butter wasn’t very sweet. 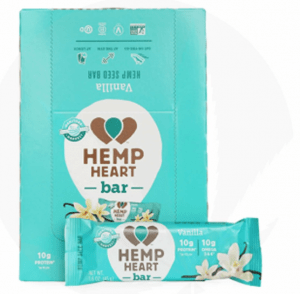 The Hemp Bar has great nutrients as hemp is the only food with all amino acids. Pro: taste salty but is actually low in sodium Con: Not very sweet and I love sweet. Also high calorie /fat for a TINY bar. 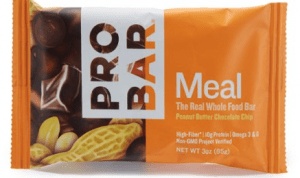 The Pro Bar Meal was incredibly delicious but all of the chocolate chips and gooey-ness of it made me feel like I was eating a desert and it didn’t fill me up. Pro: great taste Con: 370 cals and not super filling as an actual meal. I’d prefer Amy’s gluten-free, dairy-free Lasagna for 340 cals. The Luna Protein Bar was a blast fromt he past. I used to eat these before Quest bars were around. I didn’t like the taste. it taste very fake and it bothered me that I’m trying to eliminate things from my diet yet this had three times the amount of ingredients that quest bars have. Anyways, Pro: only 170 cals Con: don’t love the taste, is kind of a small bar. Overall, I’d probably only buy the first two bars in a pinch. My true loves are Quest Bars, No Cow Bars, and Oh Yeah One Bars. I’m repeating the polyols again this week because I had mushroom Saturday night and generally speaking didn’t feel much better last week without erythritol (which was the polyol I realized I consume most frequently). Next week I’ll probably add the bars back in, unless I have an epiphany this week! 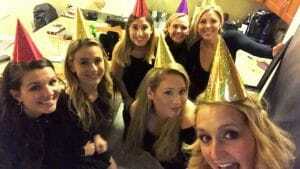 People ask me about this often, especially because 1) I wrote about how I drank alcohol during both of my bikini preps and did well and 2) it was a 2016 goal of mine to be more social and that typically involves drinking/ social eating. First of all, if you haven’t read any of the “100 Fat Loss Tips for Summer” series, see below! eat protein and whole foods (grab them when you see them and keep them on your person so you have healthy options). at the very least, do morning stretching after sitting on planes, trains etc. The two biggest things that allow me to eat and drink socially (in my opinion) are that I do it sparingly and enjoy it thoroughly when I do. Two, I have a very consistent training schedule which has helped me build a LOT of strength and muscle increases metabolic rate. Basically, I can eat more than most girls at 5’2″ and not gain weight. Wanted to share the video with you below because it is one way I help myself get into some deeper stretches when I don’t have assistance or I don’t have a foam roller handy. Try these on a high block at your gym or even on a chair, the back of your couch or the main part of your couch if you have to! Client Spotlight: Meg pulls 205 pounds for 2 reps! She never knew she’d be able to deadlift 200 pounds, but now here she is pulling 205 pounds for 2 reps and making it look easy!!! WOWZA!! Go, Meg! !